Free Cash Flow to the Firm (FCFF) is the cash flow available to all the firm’s suppliers of capital once the firm pays all operating and investing expenditures needed to sustain the firm’s existence. Operating expenditures include the fixed and variable costsFixed and Variable CostsFixed and variable costs are important in management accounting and financial analysis. Fixed costs do not change with increases/decreases in units of production volume, while variable costs are solely dependent on the volume of units of production. This guide teaches an analyst the fixed vs variable cost methods, inputs required by a company to generate its primary economic benefit, and revenuesSales RevenueSales revenue is the starting point of the income statement. Sales or revenue is the money earned from the company providing its goods or services, income. Investing activities include expenditures by a company in its property, plant & equipmentPP&E (Property, Plant and Equipment)PP&E (Property, Plant, and Equipment) is one of the core non-current assets found on the balance sheet. PP&E is impacted by Capex, Depreciation and Acquisitions/Dispositions of fixed assets. These assets play a key part in the financial planning and analysis of a company’s operations and future expenditures, as well as intangible assetsIntangible AssetsAccording to the IFRS, intangible assets are identifiable, non-monetary assets without physical substance. Like all assets, intangible assets are those that are expected to generate economic returns for the company in the future. As a long-term asset, this expectation extends for more than one year, on top of short-term working capital investments such as inventoryInventoryInventory is a current asset account found on the balance sheet consisting of all raw materials, work-in-progress, and finished goods that a company has accumulated. It is often deemed the most illiquid of all current assets, and thus it is excluded from the numerator in the quick ratio calculation., and the deferred payments and receipts of revenue in its accounts payable and receivable. The remaining cash flows are those that are available to the firm’s suppliers of capital, namely its stockholders and bondholders. This guide includes a template to reconcile FCFF vs FCFE. Free Cash Flow to Equity (FCFE) is the cash flow available to the firm’s stockholders. The cash flows are inclusive of all of the expenses above, as well as the net cash outflows to its bondholders. Using the dividend discount model is similar to the FCFE approach, as both forms of cash flows represent the cash flows available to stockholders. In general, the FCFE method is preferred when the dividend policy of the firm is not stable, or when an investor owns a controlling interest in the firm. All three types of cash flows can be used to determine the intrinsic valueIntrinsic ValueThe intrinsic value of a business (or any investment security) is the present value of all expected future cash flows, discounted at the appropriate discount rate. Unlike relative forms of valuation that look at comparable companies, intrinsic valuation looks only at the inherent value of a business on its own. of equity, and ultimately, the firm’s intrinsic stock price. The primary difference in valuation methodsValuation MethodsWhen valuing a company as a going concern there are three main valuation methods used: DCF analysis, comparable companies, and precedent transactions. These methods of valuation are used in investment banking, equity research, private equity, corporate development, mergers & acquisitions, leveraged buyouts and finance lies in how the cash flows are discounted, and the primary insight to be gained is that all three methods account for the inclusion of debt in a firm’s capital structure, albeit in different ways. 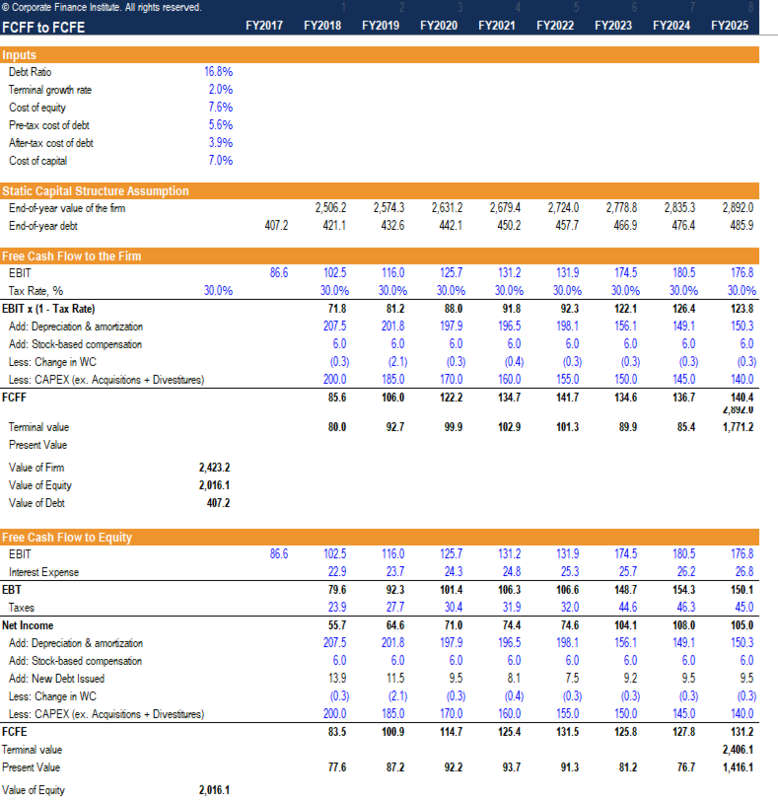 Utilizing the provided worksheet, we can illustrate how these cash flows reconcile, how they are valued, and when each type is appropriate for valuation. To reconcile FCFF to FCFE, we must first make a set of important assumptions about the firm’s financials and its capital structure. We must assume that the capital structure of the firm will not change over time. It is an important assumption because if the firm’s capital structure changes, the marginal cost of capital will also change. Second, we must work with the same fundamental financial variables across both methods and apply the same tax rates and reinvestment requirements across both methods. Enter the base inputs of the calculation worksheet. These include the firm’s debt ratio (which is assumed to remain static), the pre-tax cost of debt, the tax rate, the cost of equity and the terminal growth rate. The free cash flow to the firm is determined in each year by converting the company’s operating profit (EBIT) to NOPAT by multiplying by (1 – tax rate) adding back non-cash expenses and subtracting net firm reinvestment (working capital and capital expenditures). The present value of the firm’s FCFF and terminal value is added together to find the intrinsic value of the firm as of today. Assuming the company has zero cash, subtracting the value of debt from the firm’s valuation will yield the value of equity. The static capital structure assumption section calculates the value of the firm in each respective forward year, using each forward year as the present year to calculate different present values. Then, the end-of-year debt assumption is computed by taking the product of each forward year’s firm value and the static debt to capital ratio. From this point we can begin computing the firm’s equity value standalone. We begin at the firm’s operating profit (EBIT) and subtract the firm’s interest expense. The interest expense is calculated by taking the product of the firm’s cost of debt and its year-end debt in each forward year. The difference yields the firm’s earnings before tax (EBT). The tax expense is calculated by taking the product of the tax rate used in the FCFF section and the earnings before tax in each forward year. The difference yields the firm’s net income. The free cash flow to equity is computed by taking the firm’s net income in each forward year, adding back non-cash charges, subtracting net firm reinvestment just as in FCFF with one key difference. We must also add back the net increase in debt, as this is new capital that is available for the firm. The present value of the firm’s FCFE and terminal valueTerminal Value​The terminal value is used in valuing a company. The terminal value exists beyond the forecast period and assumes a going concern for the company. of its equity is added together to find the intrinsic value of the firm as of today. The first thing we notice is that we arrive at the same equity valuation in both methods. The first difference in these two methods is the discount rate applied. The FCFF method utilizes the weighted average cost of capital (WACC), whereas the FCFE method utilizes the cost of equity only. The second difference in these two methods is the treatment of debt. The FCFF method subtracts debt at the very end to arrive at the intrinsic value of equity, whereas the FCFE method integrates interest payments and net additions to debt to arrive at FCFE.